A few days ago I drove across the Romney Marsh to Hastings, to Melissa White’s textile workshop to meet her for the first time, with Danae Tankard from the Weald and Downland Museum. 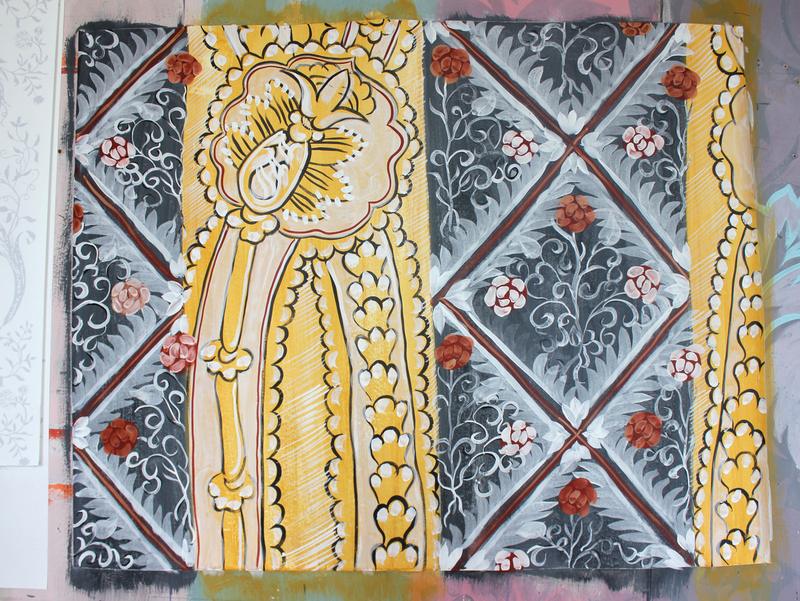 Melissa is creating a new painted cloth for the hall of the Museum’s most loved property, Bayleaf. We are making a film about the whole project, produced by Darren Mapletoft, as one of the outcomes the AHRC Domestic Interiors network – in the course of it we’ve been discussing the impact of decorative textiles and different ways of presenting them in heritage settings. 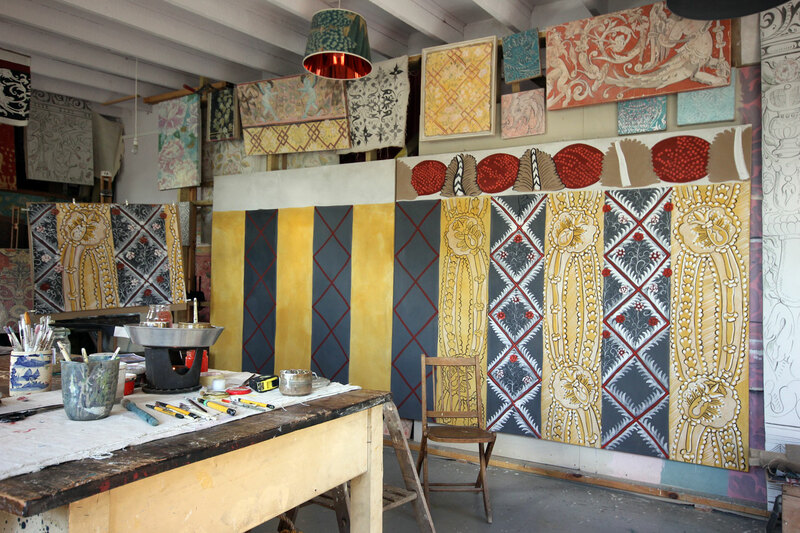 Part of Melissa’s work involves making bespoke hand painted replica Elizabethan domestic interiors, for private clients and museums (including at the Shakespeare Birthplace Trust), and part is more mainstream – she has worked with big furnishings firms such as Zoffany to create modern textile and paper designs inspired by historic interiors. So one of the things I wanted to ask Melissa about was what the difference is between these two processes – where does reproducing an historic interior stop, and designing something modern based around an early modern aesthetic start? 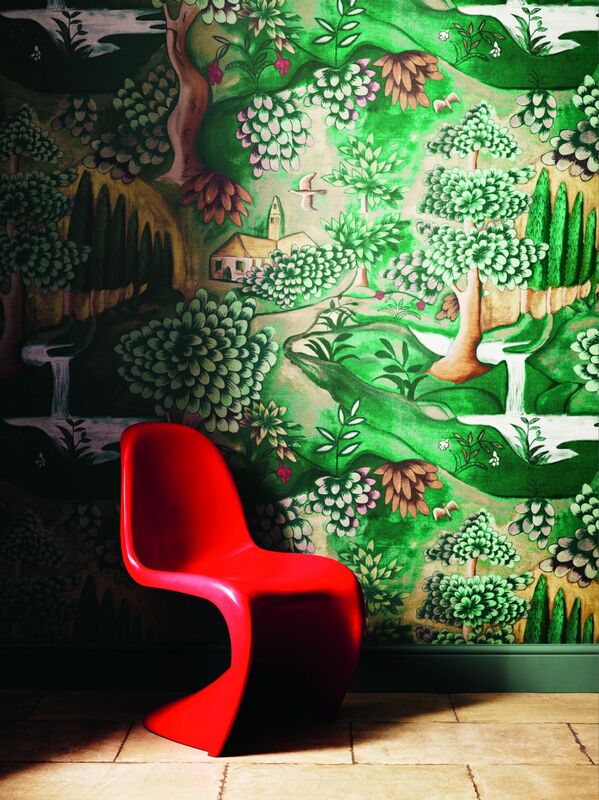 Her Zoffany design ‘Verdure’ is based on the painted cloths at Owlpen (and other related ones), but for the commercial pattern she took out the figures, turning it from a narrative sequence about Joseph to a verdant scene of characteristically early modern trees, waterfalls and buildings. The painted cloth that Melissa is producing for the Weald and Downland is based on a wall painting from Althrey Hall in Wrexham that Kathryn Davies discussed at the Network final conference (see more about the conference here). So was she copying this, or designing something based around it? Melissa talked about the processes she went through. First, she used authentic fabrics and pigments as much as possible. The canvas is sized with rabbit skin glue, the background stripes are of yellow ochre and lamp black and whiting (to make grey), and the rest of the design also includes red ochre, raw umber, and a vermillion substitute for the pomegranate seeds and some of the flowers – the small jewel-like dots of colour which shine out of the canvas and would have been the most expensive paint and therefore a signal of the owner’s wealth. She began by copying the work of the Elizabethan painters, by imitating the nature of the brushstrokes, their direction and the way of applying the paint – using every possible piece of evidence that could be gleaned from the original – and replicating slight alterations in the design exactly. This kind of learning by doing meant that Melissa was sensitive to the small changes that the original painters had made as they went along, and the variations that came about in creating a repeating pattern by hand. In other words, she was seeing how the pattern took shape by imitating the practice, rather than the design itself, and after an initial period of replication she could continue in that spirit and make her own changes. That led us on to discussing the nature of repetition. She talked about the fact that so many early modern decorative textiles replicate the nature of woven cloth, in which repeats can be produced mechanically. She sees them as aiming to imitate elite fabrics, particularly in this design the swags and the pomegranates that very expensive imported silks often contain, and we discussed where rural families might have come across such fabrics – perhaps in the vestments and altar cloths of the pre-Reformation parish church might be one place? 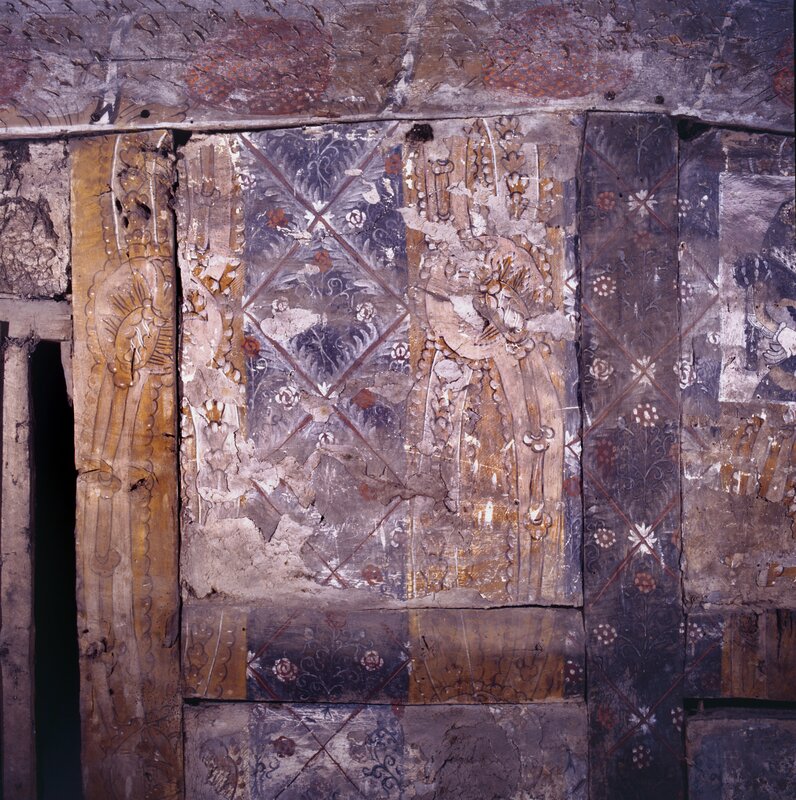 The close relationship between different decorative works – painted cloths and wall paintings for instance, meant that key deign elements from fabrics could determine the appearance of domestic interiors.